- path is normally the default "\"
You can reference the Madsonic drive from Auto-Playlists, the Auto-DJ or create manual playlists (but in all cases these reside in your MusicBee library, not on the Madsonic server). If you add files to your local MusicBee library, MB will keep track of playcounts and enable ratings to be stored (but only in the local MusicBee library cache, not on the server). In the main panel, MusicBee will only show the tags that Madsonic makes available which are the basic ones you need (Artist, Title, Album, Track#, Year, Genre and Duration). you could add album artist support? i find a bug, if your sctructure have () like artist/(year) album/filename.ext. the plugin dont work. you could please add album artist support? becuase is a mess without them. HeavenNight wrote: i find a bug, if your sctructure have () like artist/(year) album/filename.ext. the plugin dont work. 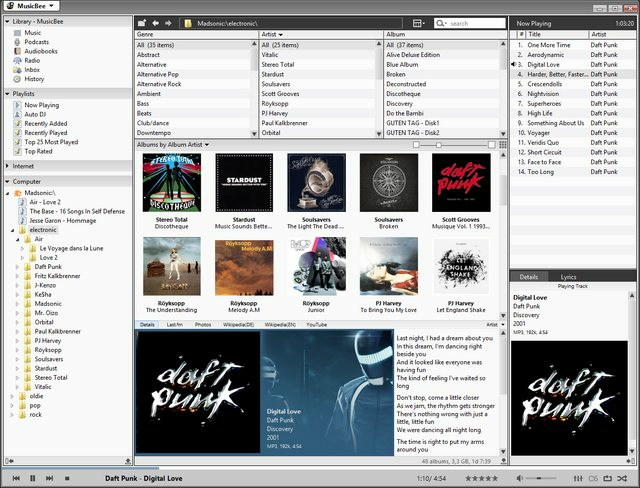 Besides of that bugs, the plugin is working very well i use daily without any problem, just need add support for ssl servers and album artist and this become the perfect plugin / desktop madsonic player. Thank you very much for you work.